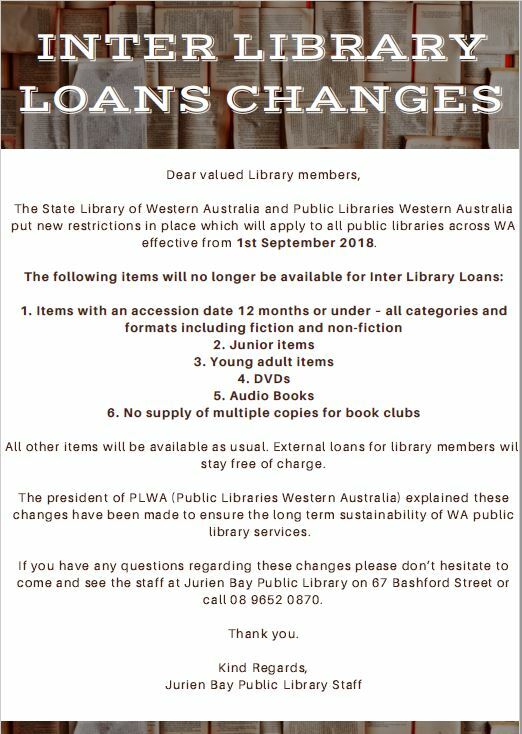 PLEASE NOTE: from the 1st September 2018 some items are no longer able to be requested through the Inter-Library Loan System in Western Australia. For further information please click here or contact your local Shire of Dandaragan library. Located at the Cervantes Community Centre, Aragon Street, Cervantes. Located at the Dandaragan Community Resource Centre, Dandaragan. Located at the Badgingarra Community Centre, Badgingarra. Membership to the Shire of Dandaragan libraries is free and can be made in person at any of of the Shire libraries. You will need proof of your current residential address (eg drivers license) and you will be able to borrow items that same day. Holiday membership is also available for temporary residents or visitors to the Shire. Membership will provide access to all four libraries in the Shire as well as any online resources available in the library online catalogues. All items in any Shire of Dandaragan library catalogue can be accessed online via the following link: Shire of Dandaragan Library Catalogues. You can search the online catalogues but if you would like to reserve an item or access your library membership account you will need to log in. Use your library card number (barcode) as the username and your 4-digit PIN as the password. If you do not know your PIN please contact your local Shire of Dandaragan library and staff can look up your membership details. The State Library WA has reciprocal user rights with many online resources that provide free access for library members. Borrow Box has digital and audio book resources that library members can download. Your Username is the User ID (barcode) from your Shire of Dandaragan library card and the password is the last 4 digits of the same barcode. For first time users, select 'Dandaragan Public Library' as your local library - all Shire of Dandaragan libraries are linked to this account. If you have trouble logging in contact the Jurien Bay Public Library and they can login to the Borrow Box back office online to check your registration details or manually add a new member. Download the Borrow Box app and you can download library items to your smart phone or tablet device. Go to: Overdrive access for public libraries in WA and click 'Sign in' at the top right hand corner. Select your local library from the drop down list, enter your library card number and the 4-digit PIN for your account. If you do not know your PIN please contact any of the Shire of Dandaragan public libraries and they can look it up on your library membership information. The Overdrive app is called 'Libby' and can be downloaded to most devices. Kanopy is a streaming service to watch films and other video recordings online. It is compatible with most devices including iOS, Android, Apple TV, Roku and Chromecast and the Kanopy app is available for download. For new users click 'Sign Up' in the top right hand corner. Enter your name, email address and password into the web form provided. You will be sent an email to verify your account and once that is completed you can enter the Kanopy website from the email link. To start watching click on 'Add Library Card' and enter your library card details. Library members with a linked Kanopy account can access up to 4 movies per calendar month and you have 3 days to watch each film as often as you like. RB Digital is a magazine subscription service that public library users can access for free. Click on this link to access the site: RB Digital access and either click 'Log In' or 'Create New Account'. Enter your library card number as requested and select 'Dandaragan Library' from the drop down list. Once this registration process is completed you can download the RB Digital app and log in using those same registration details.